If bow specifications seem like techno-gibberish to you, this section will help. What does it all mean? What matters? What doesn't? Not to despair, we have this covered. By the end of this chapter you'll be jawing modern archery jargon like an old pro. To get the basics, let's start off with the fun stuff - diagrams. The discussions on this page often reference the various parts and regions of the compound bow. Please take a moment to familiarize yourself with the nomenclature from the diagrams below. The modern compound bow buyer tends to be a "spec-buyer", meaning that the bow’s advertised specifications and features are what persuade the buyer most. This wasn’t always the case. Compound bow sales used to be driven by the “test drive” model, where buyers would test-shoot all the potential candidates and then choose one based on the try-out. When buyers have a chance to test shoot bows themselves, they tend to make their selections based on perception (e.g., a smooth pull, a comfortable grip, a steady feel, an attractive look, etc.) rather than specifications; we’re not suggesting that’s necessarily a bad thing. Some archery stores still utilize this time-honored method of bow salesmanship. Nevertheless, the retail market has changed, and the test-drive method of bow shopping has become less common. Many of today’s compound bow buyers are entirely self-directed, conducting their own research (and their purchases) online. That changes the game. Without a bow in-hand to physically evaluate, modern buyers must rely on technical specifications, features, reviews, photos, videos and other media to guide them. Unfortunately, many new buyers have no idea what those specifications really mean. So it would be like trying to pick-out a new television without understanding the terms aspect ratio and display resolution - which would make the numbers meaningless. So let’s begin by looking a typical set of advertised bow specs, and go through what those numbers really mean. Get comfy. This will take a few minutes. Here is an advertising blurb from the 2017 Bowtech Reign 6 which lists the bow’s specification highlights. WHAT IS IT? What is a draw length? Compound bows are a little different from traditional recurves and longbows. Unlike traditional bows which can be drawn back practically any distance, compound bows are engineered to be drawn back only so far - and then stop. This distance is known as the bow's "draw length", and it's controlled by the mechanical systems on the bow. The trick is, the mechanical setting of the bow and the physical size of the shooter need to match. If your physical size requires a bow with a draw length setting of, say, 29 inches, then it can be said that "your draw length" is 29 inches. So both YOU and the BOW have a draw lengths that must match up, sort of like matching a size 10 foot to a size 10 shoe. Determining draw length fitment begins with measuring the person (more on that in a moment) and then finding a bow which can adjust to fit that person. Unfortunately, every compound bow has a limited range of mechanical adjustment, usually just a few inches. So we have to get this one right. It's absolutely critical the bow you select have enough mechanical adjustment to fit your body. As you might expect, bow companies try to engineer bows to fit their intended target audiences. For example, a typical draw length range to accommodate most adult men is about 25 to 30 inches. So, not surprisingly, many men's bows are engineered to adjust within that range, give or take. The sample bow in the photo above adjusts from 24 to 30 inches of draw length, but it WOULD NOT fit shooters who require a 31 inch draw length, or a 23 inch draw length. We must consider those draw length ranges as hard limits. They cannot be safely modified outside of the specified range. If a particular bow cannot adjust to fit your body's draw length requirement, that's a deal breaker. Choose a different bow. ARMSPAN METHOD WORKS! We've utilized this method for fifteen years ... the trusty Armspan/2.5 method. To measure your draw length requirement, determine the length of your arm-span in inches. Stand with your arms out and palms facing forward. Don't stretch when measuring. Just stand naturally. Have someone else help you, and measure from the tip of one middle finger to the other. Then simply divide that number by 2.5. The quotient is your approximate draw length (in inches) for your body size. If you are a person of average proportions, your arm-span will be roughly equal to your height (in inches). So there is often a direct correlation between a person's height and their draw length, so you may use the scale below if you wish. But if you are particularly lanky, stocky, etc., the arm-span/2.5 method will still yield the most reliable estimate. RELATED JARGON` Discussions about draw lengths often include other technical terms (cams, modules, draw-stops, valley, etc.). We will cover more of that later in our chapter on cams. But just to be clear, the draw length of the bow is NOT adjusted by altering the length of the bow's strings or cables. Draw length adjustments are made on the bow's cam(s) - either by changing the cams entirely (draw length specific/not common today) or by making an adjustment to a small metallic insert in the cam called a module. The length of string which is "let-out" during the bow's drawstroke, which determines the draw length of the bow, is controlled by one specific groove/area of the cam. So rather than machine entirely different cams for each draw length, manufacturers just make different bolt-on inserts for that one small area of the cam (the module). So rather than change a whole cam to adjust a draw length - you just change a little module in the cam. Brilliant! These modules are comparatively cheap and easy to machine, so a "modular" style cam is much more convenient to adjust for draw length (changing whole cams is a pain). Many manufacturers even go another step by making "sliding modules" instead of separate inserts. The sliding module is even more convenient, allowing draw length adjustments without the need for additional parts. It's not important that you understand the ins and outs of module technology, but just know that when you hear a discussion about modules, it's usually in reference to draw length adjustments on the bow. WHAT IS A DRAW WEIGHT? The draw weight of a compound bow is the amount of pulling force required to draw the string back - simple enough. But keep in mind, the draw weight of a compound bow is neither static or linear. That is to say, it isn't like pulling on a rope with dead weight at the end - and the draw weight doesn't get progressively harder the farther you draw the bow back (like a longbow). The draw weight of a compound bow is managed by the geometry of the cam system, so the required effort rises and then falls during the draw cycle. That's sort of what makes a compound bow "compound." The draw cycle is mechanically manipulated to maximize energy storage and give us some ergonomic advantages that traditional equipment cannot. As a general rule though, less effort is required at the beginning and at the end of the compound bow drawstroke, and somewhere in the middle of the powerstroke is the "peak weight" - "the hump" - the point where your maximum effort is required. This is where a compound bow's draw weight is measured - at the heaviest point of the cycle. DRAW WEIGHT RANGES. A bow's actual draw weight range is a function of many things (limb thickness, limb length, limb shape, limb preload, cam design, limb pocket design, hardware choices, etc.). But from a consumer standpoint, choosing a draw weight range is really just choosing one of the bow's limb options. The bow companies do all the engineering to make this a neat A, B, or C choice. All you have to do is pick one. Generally a bow's limbs come in 10 lb. increments. Some bows have more choices than others, but for a typical bow - you'll be asked to choose between 40-50#, 50-60#, or 60-70# limbs when ordering the bow. If you choose 50-60# limbs, for example, the bow can be adjusted for any draw weight within that 10# range (51#, 54#, 58#, etc.). However, it cannot be adjusted to say, 65#, or any other value outside of the 10# range. If you decide later that you want a draw weight that's higher or lower than the range you originally chose - your bow will need to have new limbs installed. THIS CAN GET CONFUSING! It's pretty easy to understand that a 50-60# bow adjusts from 50-60 lbs., but some manufacturers won't always say "50-60#", they'll just say "60#", which confuses consumers. 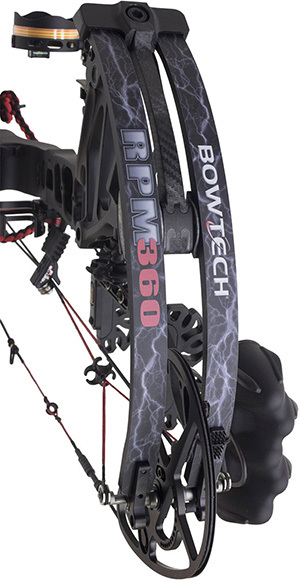 Take a look at the Bowtech Reign 6 ad above. The draw weight ranges listed are "50, 60, 70". Some buyers will assume this means they can only get 50, 60 or 70 pounds of draw weight, which isn't true. Nevertheless, listing a 50-60# bow as just a "60#" bow seems to imply the limbs are essentially non-adjustable (which isn't true). We assume manufacturers do this because they think it's obvious or because they're just trying to keep their ads neat and tidy, but we get this question all the time in our pro-shop. If a bow is listed as a "70#" bow, it's safe to assume it at least has ten pounds of adjustment (60-70#). Which brings us to another quirk. Some manufacturers will list their draw weight ranges as one sweeping range, like 40-70#, meaning 40-50#, 50-60# and a 60-70# options are available. They don't actually specify the three different configurations separately, and this creates confusion, you're going to love this, because some bows really do have large sweeping ranges on a single limb option. For example, the 2016 PSE Stinger X has a 70# limb which actually adjusts from 45-70#. But that doesn't mean PSE bows automatically have 25# adjustment ranges. The 2016 PSE Decree HD has a 70# limb which actually adjusts from 55-70#. Did we mention this can get confusing? Pay close attention when selecting draw weight ranges on your new bow. Most manufacturers make it clear, a few do not. HOW MUCH DRAW WEIGHT DO I NEED? We cover this issue in more detail in our Compound Bow Fitment Guide, but for quick reference, here are some general guidelines for choosing an appropriate draw weight based on body type. Of course, each individual is different. You should apply your common sense here and interpret this chart with due respect to your own age and general physical condition. IBO SPEEDS ARE KING! In the archery industry - speed sells. And today, the proverbial line in the sand is about 320 fps (feet per second). 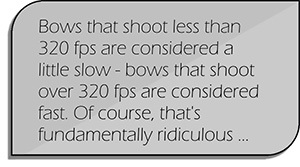 Bows that shoot less than 320 fps are considered a little slow - bows that shoot over 320 fps are considered fast. Of course, that's fundamentally ridiculous ... 310 fps is 211 mph, 330 fps is 225 mph. If one exotic supercar could go 211 mph and another 225 mph, you wouldn't call either slow. Nonetheless, that's the market perception with compound bows. Additionally, there are upper and lower limits - so to speak. A bow that shoots less than 300 fps is considered unacceptably slow, and a bow that shoots 340 fps or above is considered a screamer (speed bow). Whether it's actually a big deal in the field or not, speed is a monumentally big deal at the sales counter. Fast bows rule - slow bows drool. HOW DO YOU GO FAST? If you're just getting into the sport, and you're not sure what these horsepower numbers mean, or even what makes a particular bow fast or slow - let's start at the top. On the most basic level, there are three main components that yield faster arrow speeds: more draw weight, more draw length, and lighter arrow mass. Conversely, lower draw weights, shorter draw lengths, and heavier arrows yield slower arrow speeds. On the front end, it's all about energy storage and how much of your muscle energy you can transfer into the bow. The higher the draw weight (force) - the more power the bow stores and the faster the arrow will shoot. The longer the draw cycle (distance) the more power the bow stores and the faster the arrow will shoot. Yep - just like the old high-school physics equation, work=force x distance. Now, when you release that stored energy by shooting the bow, most of that energy gets transferred into the arrow and the arrow rockets downrange. Awesome! Putting aside the issue of efficiency for now, all you need to know is that lighter arrows provide less resistance - heavier arrows more. So lighter arrows go fast, heavier arrows go slow. Easy enough, but all three of these key components (draw weight, draw length, arrow mass) are critical measurements which profoundly affect final arrow velocities. THE SKY'S THE LIMIT, RIGHT? For the purposes of testing and coming up with advertised speed-ratings, a slick manufacturer could establish their bow's advertised speed using an unrealistic 120# draw weight, a super-long 34" draw length, and use a flyweight 250 grain arrow. Surely that combination would yield a blazing fast test speed which would help to sell more bows, right? Well, not so fast. The willy-nilly nature of the compound bow business not withstanding, we do have some rules and regulations. To keep the speed ratings fair (and useful for consumers), the industry uses an "Apples-to-Apples" method of comparison, where each bow manufacturer must rate their bows at the same draw weight, draw length, and arrow mass. Measuring and declaring those advertised IBO Speed numbers is serious business. 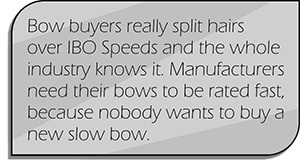 Bow buyers really split hairs over IBO Speeds - and the industry knows it. Manufacturers need their bows to be rated fast, because nobody wants to buy a new slow bow. WHAT IS AN IBO SPEED ANYWAY? Manufacturers generally rate their bows using the established IBO (International Bowhunting Organization) Standard. To get an accurate IBO Speed rating, manufacturers must test their bows under the same preset conditions: setting the bows for exactly 70# Peak Draw Weight, exactly 30" Draw Length, and they must shoot a test arrow that weighs precisely 350 grains. This levels the playing field on basic settings, so the differences in IBO scores reflect other design attributes (brace height, cam aggression, bow efficiency, etc.). But as we said, speed sells, so that little number in the brochure has a direct impact on the bow company's cash register (... and lead us not into temptation). You won't like this, but most manufacturers rate their own bows. There is no testing authority or industry watchdog. As a result, the IBO Speed testing process is subject to some creativity. Bow manufacturers usually give themselves a few added advantages by testing the bows with a bare arrow shaft (no fletchings), a naked string (no nocking point, peep sight, or silencers), the lowest possible let-off setting, and with a drop-away style rest. This helps to maximize storage and eliminate friction so it's possible to squeeze out a few extra fps, but it doesn't necessarily reflect realistic shooting conditions. Manufacturers can also squeeze-out a few more fps by shooting the bows from the hard-wall (forcibly drawing the bow back a little too far) rather than from the soft valley (more on wall and valley concepts later). And finally, the manufacturer's IBO speed is likely to reflect their "best" test, rather than their average test. ONLY ENGINEERS CAN MEASURE! With little more than the honor system to oversee and enforce the rating process, most bows end up with advertised IBO speeds that are optimistically high, and nearly impossible to duplicate. After all, most consumers don't have the benefit of a chronograph, and few people actually shoot 70# DW, 30" DL, and exactly a 350 gr arrow. And even if they did, there will always be some percentage of variance among scales and chronographs to help dismiss any claims of discrepancies. If you complain that your bow isn't shooting its advertised IBO Speed, you're guaranteed to be questioned about the accuracy of your measurements and testing equipment. 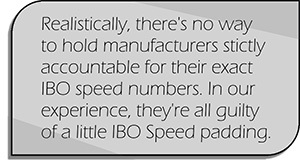 Realistically, there's no way to hold manufacturers stictly accountable for their exact IBO speed numbers. In our experience, they're all guilty of a little IBO Speed padding. But to be fair, most are careful not to get too carried away. A little padding and outright fabricating are different things. JUST A LITTLE SWEETER` As such, we recommend you consider the manufacturers' ratings as high-estimates. In most cases, the IBO speed is still a reliable method of "Apples-to-Apples" comparison among different bow models. We just have to accept that manufacturers often doctor-up their apples to be a little sweeter than they actually are. It's just part of the game. So don't assume something is wrong with your new bow just because it doesn't shoot as fast as its posted IBO Speed. Very few bows do. To be fair, we aren't suggesting that all bows are overrated for speed. In the past few years, some manufacturers have really made an effort to put integrity back into their IBO Speed ratings. We've even tested a few bows which beat their published IBO Speeds recently. What is the world coming to? DON'T GET TOO STRUNG-OUT ON SPEED! While we understand how speed is a big selling point for compound bows, and a major performance characteristic that merits concern, we strongly suggest you not get too caught-up splitting hairs over IBO Speeds. Compared to the bows of just twenty years ago, any modern compound bow is blazing fast. In the field, there is no appreciable difference between a 320 fps bow and a 330 fps bow. So keep the speed ratings in reasonable perspective and treat them as estimates - not absolutes. And remember, this is supposed to be for fun. You're not trying to launch a communications satellite into synchronous orbit, you just want to get an arrow flying hot and flat to the bulls-eye. To that end, a few points of IBO Speed won't make any difference one way or the other. THE BASIC MEASUREMENT` A bow's brace height is simply the distance from the string (at rest) to the pivot point of the bow's grip (the deepest part of the grip). You can think of brace height as basically where the string starts off. The trick is, when the string starts off closer to the riser (grip), you have to pull the string father to get the bow drawn back. So if a bow has a shorter brace height, it has a longer powerstroke/drawstroke and pulling a longer powerstroke means more speed and power. If a bow has a taller (longer) brace height, then the bow has a shorter powerstroke/drawstroke and the bow builds a little less speed and power. Easy enough, right? All you have to remember for now is shorter brace heights yield faster speeds. Taller brace heights yield slower speeds. NOTE: For reasons we cannot explain, brace heights are described as short and tall rather than short and long. It's kind of improper to say "a longer brace height." It's "taller." Although you would never say "a taller draw length", -not that it really matters ... but just so you know if the question comes up on Jeopardy. WE ALL WANT FORGIVENESS! As with many things in archery, there's a trade-off to consider here. Short brace height bows are generally considered to be less forgiving and it is commonly believed short brace height bows require more skill to shoot. Taller brace heights are the opposite. 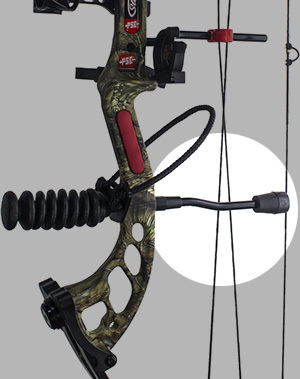 Taller brace height bows are often characterized as being more forgiving and easy to shoot. It's a theoretically valid concept. The longer the string is in contact with the arrow, the more opportunity there is for a form glitch or bobble to translate into the arrow flight. So a short brace height bow should require a highly skilled shooter, while a tall brace height bow can have a novice at the helm. Sounds logical, right? We subscribed to this philosophy for years, that is, until we realized the issue was being dramatically overblown and misrepresented. STRING STOPS MAKE US RETHINK BRACE HEIGHTS! The industry-wide adoption of the string stop changed everything. The string stop physically arrests the forward motion of the string at brace (center). So when you fire the bow, the string cannot carry forward beyond it's starting point and smack into the shooter's wrist or forearm. Thank God! Anyone who has been popped by a bow string knows how excruciating string slap can be. The string stop saved us from all that. Today, virtually every bow on the market has an integrated string stop, and it has changed our perception of short/tall brace height issues. Before the string stop, the average shooter tended to get "popped" by the string of a short brace height bow. Only experienced shooters could manage to manipulate their grip and stance enough to avoid the incoming string. To add insult to injury, we even criticized new shooters for having "bad form" if their string was popping their wrist or forearm. Back in those days, the line in the sand was about 7 inches - meaning that the average shooter could shoot a 7 inch brace height bow without getting popped, but the 6 inch brace height bow ate average shooters alive. So a prejudice developed in the industry regarding bow brace height. Short brace height "speed bows" were only for skilled shooters and adrenaline freaks - and tall brace height "forgiving" bows were for responsible bowhunters and everyone else. MISDIRECTION! Bow manufacturers naturally co-opted the prejudice and marketed their bows accordingly, making great technical hay about the enigmatic issue of "forgiveness." Manufacturers tended to showcase their innovations on a 7 inch flagship bow, and then make a 6 inch "chronograph bow" just for showing off. It was a strange time. Brace height was a big deal. And if we would have been talking about the difference in 5 inches of brace height versus 10, the forgiveness debate might have had some merit. But the entire brace height debate was waged within one little inch - from 6 to 7 - and we all bought into it. Even today, very few bows have brace heights below 6 inches or above 7 inches. The compound bow market is still trying to hang onto the fast or smooth - six or seven mantra. Perhaps it's just habit at this point. Either way, we submit the brace height debate had very little to do with shooting form glitches. It was always about getting popped on the arm! Everybody wanted to shoot those fast 6 inch brace height bows, but not at the expense of skin. So we all talked about the sixes, but we bought the sevens. But then came the string stop, bringing a long painful era to a close. WHO JUMPED FIRST? Ten years ago, virtually every flagship bow in the industry had a 7 inch brace height - no more no less. At the time, market perception deemed that a brace height of 7 inches delivered the ideal blend of speed and good shooting manners. Anything slightly under 7 inches wasn't acceptable (too radical), and anything much over 7 inches was considered a compromise on speed. But as the string stop became "standard equipment", somebody eventually jumped ship (we don't recall who). At the sight of the first 6 inch flagship bow, we gasped! Few serious bowhunters are going to buy a radical speed bow! But people did buy them, and most people loved them. Almost overnight we seemed to have a shop full of 340-350 fps powerhouse 6 inch bows which weren't devouring wrists and forearms, and they didn't need seasoned experts to shoot them well. Few customers seemed to notice or care about their missing inch of brace height. They weren't getting smacked by a 200 mph string. That's what ultimately mattered. In recent years, most bow manufacturers have joined in the hunt with their own 6 inch flagship bows, and the 7 inch brace height prejudice has fizzled to a murmur. The market yammer about brace height and forgiveness started to quiet, and today the 6 inch brace height is practically the standard for flagship bows - all of which, incidentally, now come standard with integrated string stops. DOES BRACE HEIGHT MATTER? Sure it does. An 8 inch brace height bow will certainly be more mannerly than a 5 inch brace height bow. How much of that is attributable to the 3 extra inches of powerstroke and how much is the result of inherent "forgiveness?" We simply can't say. What we know for sure is the market has changed. We use to see a big variety of brace heights, spattered from 5.5" up to about 9.0", in all sorts of random fractional increments (6-3/8", 7-1/4", 5-7/8", 8-1/8", etc. ), but not really any more. The good majority of the bows on the market today are specifically designed to yield a brace height target of exactly 6 or 7 inches. Of course, we're aware of no mathematical calculation whereby the 6 or 7 inch brace height yields some magical bow performance apogee. Nevertheless, that's how things stand today. The only thing you really need to remember is that the "standard" brace heights aren't standard at all. They're arbitrary - incidental - the effect of marketing on consumer perception. That's all. Nevertheless, chances are, when you shop for a new bow, most of your brace height choices will be within that "one little inch." GENERAL RECOMMENDATIONS` If you're shopping for a short-draw, youth or ladies model, don't get too hung-up on brace height. Shorter draw lengths would be less susceptible to any "forgiveness" penalties associated with short brace heights anyway. Shorter draw length shooters will benefit more from the added powerstroke length. So if you have the option, take the shorter brace height and the performance benefits for draw lengths of 27" and under. If you're a taller shooter (28"+ draw length), you'll get better manners out of a 7 inch. But again, don't spend too much time debating that one little inch, and don't pigeonhole yourself into any particular brace height camp. At the shooting line, the difference in modern sixes and sevens is more subtle than you might think. What you'll notice most is just the length of the powerstroke. Even with identical peak draw weights, the sixes feel a little tougher to draw back - the sevens feel a little easier. But again, it's subtle - one little inch. BRACE HEIGHT PURGATORY` Better yet, use this market obsession to your advantage by shopping the brace height purgatory bows. They're out there, and strangely enough, the "off" brace height oddballs may offer smart shoppers bargain hunting opportunities. There are a number of bows on the market which have fractional brace heights (6-1/2", 7-5/8", 7-1/8", etc.) - presumably from manufacturers who didn't get the 6/7 memo. Oddly enough, these bows are proverbial market bastards. There's nothing wrong with the bows, but they're often significantly undervalued/devalued simply because they're different. Spec buyers aren't sure what to make of them, and they're some of the first bows to hit the closeout rack. So keep an eye out. You may find some of these great bows at an excellent buy - if for no other reason than market trends and buyer prejudices have left them stranded. A CURIOUS WAY TO MEASURE` A bow's axle-to-axle length is just what it sounds like. At the end of each limb is a steel axle which attaches the rotating eccentrics (cam or idler wheel) to the bow. The distance between the centers of those two metal rods (axles) is the bow's advertised axle-to-axle length. You can think of this as the bow's overall length, but that isn't entirely accurate. Modern compound bow cams are usually 4-6 inches in total diameter, and the axle is roughly in the middle of the cam's placement on the bow. So beyond the axle, 2-3 inches of cam extends above the top axle and below the bottom axle. So if you stood the bow on end and measured its actual physical height, you would get a measurement roughly 4-6 inches higher than the advertised axle-to-axle length. To be clear on the nomenclature, axle-to-axle length is described as short and long (not tall), and bows are commonly referred to simply as short-axle and long-axle. What constitutes a short-axle and a long-axle bow seems to be a matter of opinion. DOES IT MATTER? Yes. Axle-to-axle length is an important specification to consider. There is a noticeable difference in the stability of varying axle-to-axle length bows. It isn't a profound difference, like you might see when comparing a rifle to a handgun. But longer bows are a bit more stable. Shorter bows are less stable. In much the same way a longer pendulum oscillates more slowly than a short one, the longer bow tends to be easier to hold steady while aiming - a shorter bow is the opposite. That's the theory anyway, and we submit it's generally true. Does that mean longer bows are all automatically more accurate than shorter ones? Of course not. There are dozens of elements which can make a bow more or less accurate. Axle-to-axle length is only one contributing attribute. But all other things being equal, an extra-long 45 inch axle-to-axle competition bow would certainly be easier to shoot accurately than a super-short 28 inch axle-to-axle hunting bow. But those are extreme examples from opposite ends of the market. For hunting bow buyers, long isn't that long, short isn't that short, and the effective difference between the long-axle bow and the short-axle bow is more of an academic discussion. HOW SHORT IS SHORT? HOW LONG IS LONG? We should start with what defines a bow as short or long, and you're not going to like this, but the answer is ... there is no definition. There is no official classification system which designates one compound bow as long-axle and another as short-axle. It's like trying to determine if someone is considered tall or short. It depends who you ask and what company you're in. A 5'10" jockey would be tall; a 5'10" point guard would be short. With that said, bowhunters see the long vs short issue much differently than pure competition shooters. For the bowhunter, most of the compound bow market is compressed into just a few inches of axle-to-axle length. THE 30-33 INCH SWEET SPOT` Much like the 6-7 inch brace height convention, the overwhelming bulk of compound (camouflage/hunting) bows on the market today have axle-to-axle specs of 30-33 inches. Again, we're aware of no magical performance apogee at 30-33 inches of axle-to-axle length. Nevertheless, this is the clear strike-zone for "hunting" bows. Virtually every flagship bow hits this sweet spot without fail - as they should. That's what buyers want. That's the zone where all the money is spent. A compound bow with an axle-to-axle length outside of that zone is a factory close-out sale just waiting to happen. And there is very little room for grace, perhaps no more than in inch in either direction. Bows of 29 inches or less, and 34 inches or more are all flirting with the edge. In fact, we're particularly cautious about how many "out of zone" bows we stock in our store. 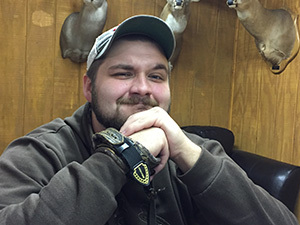 A bow with a very short axle-to-axle length (29 inches or less) is considered a specialty treestand bow (for maneuvering in tight-quarters blinds and stands), and a bow with a longer axle-to-axle length (34 inches or more) is considered a specialty crossover or 3D bow (for dual service as a hunting/competition bow). There are a few buyers out there who want out-of-zone hunting bows, but the market for these specialty products is tenuous at best. The major compound bow manufacturers are acutely aware they must design most, if not all of their bows, to have exactly 30-33 inches of axle-to-axle length. The market bias is so strong, some manufacturers even name their bows with the axle-to-axle length in the title (e.g., Bow Madness 32, Impulse 31, Arena 30, etc. ), so potential buyers know right away that their bows are in the sweet spot. PERSPECTIVE AND PURISTS` Long time archery purists never miss a chance to scoff at the notion of a 34 inch long-axle bow, and they might be right. Within the historical context of the compound bow, today's bows are all short - 30-33 inch hunting bows are practically miniatures. 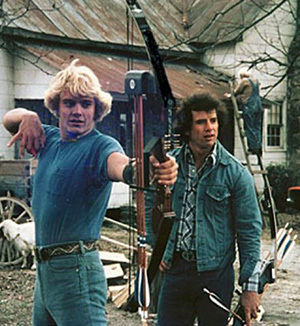 Early compound bows were commonly four feet long (think Bo & Luke Duke). The incredible shrinking bow phenomenon didn't really get crazy until the new millennium. Advances in construction techniques and materials made it possible to build more and more compact bows, so we did. And for a while, shorter was better. Each year the average bow got a little more compact, until consumers finally pushed back around the 30 inch mark. It's similar to the phenomenon with cell phones. Early cell phones were huge. Then they progressively got smaller and smaller until consumers eventually pushed back when they got too small. A smart phone with a 4 inch screen (iPhone 5) is about the minimum size the public accepts today. Phones smaller than that risk falling out of mainstream consideration. The 5 inch screens (iPhone 6, Galaxy, Moto X, etc.) get the most love today, and the 6 inch screen phones are pushing the upper limit. So phones with screen sizes of 4-6 inches rule, all others drool. It's no different than the 30-33 inch range of compound bow axle-to-axle lengths. Manufacturers make what buyers want to buy. Does that mean the 30-33 inch compound bow is technically ideal? No. In fact, we submit the 30-33 inch axle-to-axle bias is no less silly than the 6-7 inch brace height bias. So it's another issue we have to keep in perspective. If compound bows were only built in 25 inch, 35 inch and 45 inch axle-to-axle lengths, a discussion about the usefulness and benefits of each size would be valid. But again, the entire hunting bow market is compressed into a few inches of similar axle-to-axle length, so splitting hairs about it is technically myopic. ALL of the mainstream hunting bows are short-axle bows, and there is no reason to dissect the matter further. If you want a mainstream hunting bow (as 90% of buyers do), it will be a short-axle bow, and it will have the shooting characteristics of a short-axle bow. And don't listen to anyone yammer-on about how a 33 inch bow is more forgiving than a 31 inch bow. It won't be - the difference will be negligible. Consider it entertainment, smile and move on. 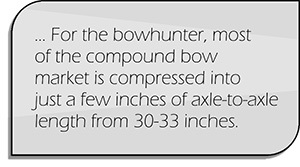 GENERAL RECOMMENDATIONS` If you're buying a mainstream 30-33 inch hunting bow, you can safely ignore any debate about axle-to-axle length. It's moot. But if you have a special purpose in mind, or if you just prefer a shorter/longer bow, then by all means, buy a bow with more or less axle-to-axle length. As we said, it does matter. A significant change in axle-to-axle length will make a difference in stability and accuracy. But again, don't be hypnotized into thinking it will be a dramatic difference - akin to a rifle versus a handgun. At the shooting line, the difference in axle-to-axle lengths will be more subtle than you think. SPECIAL NOTE: We should also take a moment to mention finger shooters (people who don't use a mechanical release and only pull the string with their fingers). Finger shooters often seek longer axle-to-axle bows because the string angle (at full draw) is less acute. Short-axle bows tend to crowd the fingers at the nocking point. This isn't to say a finger shooter can't manage a short bow, but a 38+ inch bow seems to better suit finger shooters. Regrettably, most modern compound bows aren't designed with the finger shooter in mind - most are designed to be used with a mechanical release. So a finger shooter will need to be choosy about axle-to-axle length. GET READY TO BE IMPRESSED! Before we get started on a bow's "mass weight", we should tidy up one thing. Our industry loves to sound more scientific and technical than it really is. So it is no surprise that we constantly see bow ads which list "bow mass" or "mass weight" instead of just bow weight. Since we don't use bows in space, or on different planets, it's probably okay to just say weight and not worry about the mass vs. weight distinction. Weighing a bow is no more technical than weighing a bowling ball or a catfish, and it's probably safe to assume customers won't get confused by it and think the bow has 4 pounds of peak draw weight. So we can all just relax about Science class and use weight and pounds. Laughably, bow manufacturers tend to list their bow weights as approximate values anyway (e.g., 4 pounds). 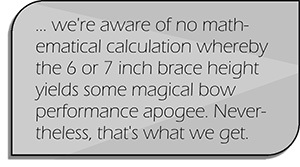 So bow weights aren't scientifically precise specs either way; they're estimates. MORE COMPRESSION` You may be tired of this theme, but the physical weight of a compound bow doesn't vary much. Most of the market is compressed into the same 24 ounces, from 3 pounds to 4.5 pounds. The overwhelming majority of compound bows fall within that weight range. Shorter, smaller and simpler bows weigh less. Longer, larger and more elaborate bows weigh more. As a general rule, bow manufacturers brag about being "lightweight" when their bows are under 4 pounds, and they say nothing when their bows are over 4 pounds. There's nothing particularly unique about the weight of our modern compound bows. The original Allen Compound was "3-1/2 to 4 lbs." and virtually every (successful) mainstream compound bow since then has hit that same range. With that said, there is some hay to be made about lightweight materials and sound construction techniques. So let's get started. FRAMEWORK FIRST! The compound bow begins with the frame - called the riser. This is the handle section of the bow - the largest piece of the bow. So naturally, the riser accounts for most of the bow's weight. The size, shape and composition of the riser is critical. Bow risers used to be made primarily from cast magnesium, but today they are generally made from machined aluminum or carbon-fiber/carbon-composites. The trick to designing a riser is to get the right balance of strength and weight - not unlike any other structural engineering effort. A bow's riser must be rigid and strong enough to resist breaking or warping, without being too heavy. Compound bow engineers busy themselves with Solidworks and AutoCAD until they have just the right frame for the bow. Not too heavy - not too flimsy. It also helps if the riser is stylish and attractive. Most compound bow risers are whittled from an extruded aluminum blank, and you'll often hear manufacturers boast about their "CNC Machined Aluminum" processes, but don't be too impressed. That's how they all do it. There are a blue-jillion products made from machined aluminum. Compound bows are just one of them. CARBON RISERS` A few bow manufacturers tinker with carbon-fiber/carbon-composite risers - admittedly with mixed results. The goal is to make a bow that's lighter and stronger, which is noble enough. But building risers out of carbon comes with plenty of new design challenges. So more often than not, carbon riser bows end-up being prohibitively expensive or aesthetically awkward (or both). But to be fair, we should give credit where it's due. The carbon bows are getting better, and carbon riser bows are a bit lighter than comparable bows made from aluminum. One day carbon risers may be the standard of the industry, but for now they remain a niche element of the new compound bow market. Some guys are crazy about carbon - some couldn't care less. DOES BOW WEIGHT MATTER? Yes! A light bow (say 3.0 pounds) and a heavy bow (4.5 pounds) feel and behave somewhat differently. Heavier bows tend to be more stable and easier to steady on target. The heavier framed bows also soak-up more noise and recoil, so they usually feel more subdued and mannerly. On the other hand, lightweight bows have a tendency to be less stable and a little more difficult to settle on target. They can also be comparatively noisy and jumpy. But we admit, these characterizations aren't always fair. We've shot heavy bows which are noisy rattletraps - and light bows which are stealthy sweethearts. But the general trend holds true. Apart from the performance predispositions, the physical weight of the bow may or may not be a concern for you. Some shooters are very sensitive to it - some barely notice one way or another. If you haven't held a modern compound bow in your hand yet, here's a quick way to gain perspective. A full 2-liter bottle of soda weighs 4.41 pounds - about the weight of the heaviest mainstream compound bow on the market. Hold it out at arm's length. Does it feel unacceptably heavy to you? Then pour-out a third of the soda and try again. Now, you have the lightest compound bow on the market at about 3 pounds. If the difference alarms you, then by all means, shop for a lightweight bow. If the difference seems insignificant, don't worry about all this. Oddly enough, the weight of two 12 ounce soda cans is all that separates the heaviest compound bows from the lightest. Does any of this make a big technical difference? Probably not. If compound bows only came in physical weights of 3 pounds, 6 pounds and 9 pounds, a discussion about the pros and cons of each size would be justified. But since the difference from one extreme to the other is effectively 24 ounces, this issue is better decided by personal preference. PURGATORY PLAYS There really isn't an underweight bias in the compound bow market. There aren't many bows under 3 pounds, so no penalty really exists. But there is a massive overweight penalty. Competition shooters will tolerate some heavier bow weights, but bowhunters absolutely will not. If a hunting bow feels "too heavy", that's a deal breaker. No sale! With all the complexities and dangly add-ons of the modern parallel-limb hunting bow, several manufacturers really flirt with this edge. Once a bow steps over this cliff of purgatory (4.5+ pounds), it's almost guaranteed to be dead weight in the stores. Bow manufacturers are acutely aware of this, and we've even seen a few who are willing to shave their published bow weights - or they simply omit the spec from their literature hoping nobody asks. Of course, that seldom works. In the hunting bow market, anchors go straight to the bottom. Here again, a portly bow can present a bargain hunting opportunity - presuming you don't mind a plus-sized hunting partner. So be on the lookout for hunting bow overweights on the close-out rack. JUST ONE MORE PURCHASE AWAY` No discussion about compound bows would be complete without specifically covering this illusive buzz word. It's not a specification or quantifiable attribute, but every bow seems to have some. As we've mentioned before, the word "forgiving" is easily the most abused (and absurd) word in our industry. We caution you about giving this concept much merit. Words like "fast" or "quiet" are at least quantifiable, but the word forgiving is mostly industry snake oil: easy to claim, difficult to dispute and everybody can have some. 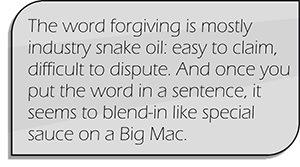 And once you put the word in a sentence, it seems to blend-in like special sauce on a Big Mac. Our bows are up to 27% more forgiving than the competition. What? The word even leaks into other related products: forgiving arrow rests, forgiving arrows, even forgiving quivers for crying out loud. We understand the need. Who doesn't want forgiveness? We're not perfect beings. We make mistakes. Sure, we all can use some forgiveness from time to time. But we submit the concept has limited application for archery equipment. The term would seem to imply that you can do things wrong, and everything will still be okay - providing your equipment is 27% more forgiving. But that's a big stretch of the truth. Our industry works very hard to convince you greatness is just one more purchase away: a faster bow, a more intricate sight, straighter arrows, fancier arrow rest, etc. But the truth is, even the best equipment can't "forgive" poor technique. If you want to be successful with your archery gear, you still have to commit to the sport and put in the practice time - no matter how much you spend. FORGIVING TO HUMAN ERROR` When equipment is described as "forgiving", should you expect anything at all? We cautiously say, maybe. At least in our industry, the term "forgiving" really means "forgiving to human error", which we might be able to justify as a function of ergonomics and bio-mechanics. But before we crack that door, we should get one thing straight. If we were to strap a variety of properly-functioning bows in a mechanical shooting machine, the varying axle-to-axle lengths, brace heights, cam characteristics and grip profiles would have no significant effect on the accuracy and repeatability of the bows. The shooting machine would shoot each bow exactly the same, each and every time. So for a mechanical shooting machine, the concept of forgiveness would be inapplicable. But if we repeated the same test with human beings, we might expect to find some bias. It's certainly logical to expect that, on average, some level of ergonomics and bio mechanics might be responsible for error attenuation or accentuation. Right? We're not machines. We can't shoot with perfect mechanical consistency. We bobble and we flinch. We punch our triggers and torque our grips. Even for the world's most talented shooters, accuracy is often limited to the occurrence of human error. So the better question is - can our equipment choices improve our odds of success? REASONABLE PERSPECTIVE` We hope you'll keep the illusive forgiveness issue in some perspective. It's more of a feel good word than a shoot good word. Good technique and a solid practice regimen will have a far greater impact on your success in the field. Within a typical 35 yard bowhunting range, virtually any properly-tuned compound bow can be shot with acceptable accuracy. And with a little practice, even a novice shooter can easily bring down big game within this range. So if you hunt in dense woods where 20 and 30 yards shots are common, your bow's forgiveness isn't really a factor. If you hunt open country, where you must be able to reach out to 50, 60, even 70+ yards, you might consider being a little more selective. YOU'RE BEING WATCHED! If you're starting to get the feeling someone is looking over your shoulder, you would be correct. The bow industry spends a lot of time and effort analyzing buyer preferences and crunching through sales data for trends. Bow manufacturers do tons of surveys and polls. They read your forums and magazines. They follow your social media. They know exactly what modern spec buyers want in a new bow (or at least what you say you want). That's why 90% of the hunting bows on the market are virtual clones of each another. The data says ... you want a fast bow that's around 4 pounds, with a 6-7 inch brace height and a 30-33 inch axle-to-axle length. Right? So THAT'S the buying experience you are presented - neatly engineered and pre-packaged just like you wanted. We're not sure if that's a good or bad thing, but that's how it works. Can I help who's next? YOU JUST PICK THE TRIM` We often mention the issue of parity in the hunting bow market, particularly as it relates to the physical attributes of mainstream bows. With virtually all of the manufacturers using the same materials, processes, technologies and target specifications, one bow really isn't so different from another. They might look different. They might have different badging and aesthetics. They may even be sold in different types of stores. 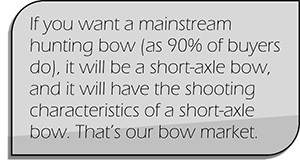 But make no mistake, mainstream bows are fundamentally the same product. As a spec buyer, your only job is to verify the key specifications and then choose the trim (price/performance) level you prefer. Everything else has already been prepared to your liking. How would you like to pay for that?